Dr. Souheil Y. El-Chemaly, M.D. 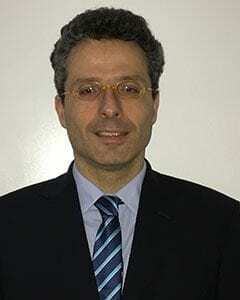 Dr. Souheil Y. El-Chemaly is the Clinical Director of the Center for LAM Research and Clinical Care and a physician at Brigham and Women’s Hospital (BWH). He is also an Assistant Professor of Medicine at Harvard Medical School. He received his medical degree from Saint Joseph University (Beirut, Lebanon). He then completed a residency in internal medicine at St. Luke’s-Roosevelt Hospital Center, a teaching affiliate of Columbia University College of Physicians and Surgeons. He also participated in two fellowship programs in pulmonary and critical care: the first at the National Heart and Lung Institute (now the National Heart, Lung, and Blood Institute), and the second at the Jackson Memorial Hospital. He is board certified in critical care medicine, internal medicine and pulmonary disease. Dr. El-Chemaly’s clinical interests include interstitial lung disease, lung transplantation and lymphangioleiomyomatosis (LAM). His lab is also researching Hermansky-Pudlak Syndrome. His recent clinical research examines the impact of interstitial lung abnormalities on mortality and lymphatic vessel formation after lung transplantation. He has written over 30 peer-reviewed publications and has received funding from the National Institutes of Health. His professional experience has included training medical residents and students, co-directing a medical practice for organ transplant recipients, and providing primary care pediatrics to children in an underserved community in Rockland County, NY. Samuel’s professional interests include preventive medical care, early disease detection, and “transitional medicine”, which is the care of adult patients who are survivors of congenital and pediatric diseases. Dr. Seward is also the only physician to have a primary care practice dedicated to those with Hermansky-Pudlak Syndrome.